File Extension Monitor is a handy tool for discovering which files are being created on your PC. Are you curious about which files an installation program is adding to your system, for instance? Or would you just like to know more about unexplained hard drive activity on your PC? Then run File Extension Monitor, and it immediately begins to track which files are being created. And you can take a look at its report at any time by right-clicking the program's system tray icon. By default File Extension Monitor records the date and time of any activity, the file which was created, and the process which created it, amongst other information. Clicking the appropriate column header allows you to sort the list by any of these attributes, so if you're looking for a particular file name, say, clicking the "Filename" column will make it easier to spot. Please note, though, that File Extension Monitor will initially only record the creation of files with particular extensions (EXE, DLL, TMP, PDF and so on). Click Monitoring > Custom File Extensions to see the list. If you want to record only the creation of particular file types, then you can add that extension here and remove everything else. Or, if you want to record everything, select "All File Extensions" and the report will cover all created files. 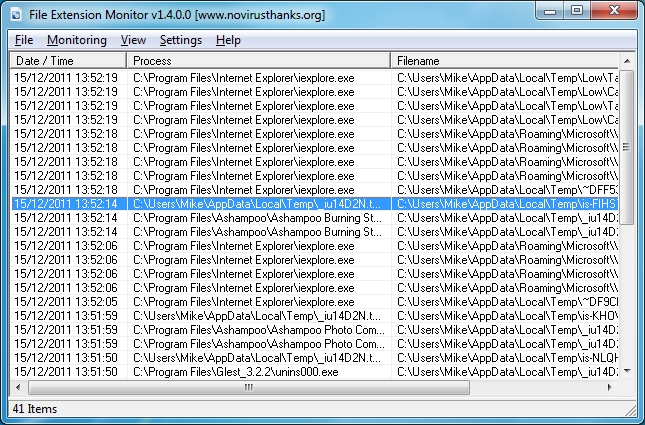 File Extension Monitor used to be a commercial tool, probably not the best of moves as it's rather less capable than many free monitoring tools from companies like SysInternals. Authors NoVirusThanks have now made it available as freeware, though, and that's much more reasonable; it's not a tool you'll use often, but occasionally the program could help you solve some otherwise rather tricky problems. We still prefer a tool like Process Monitor for general checks on what a process is doing, but if you're interested only in file creations then File Extension Monitor provides an easy way to track and display the necessary data.